As I sit here, I’m watching our friend, Manno, install a ceiling fan for us. 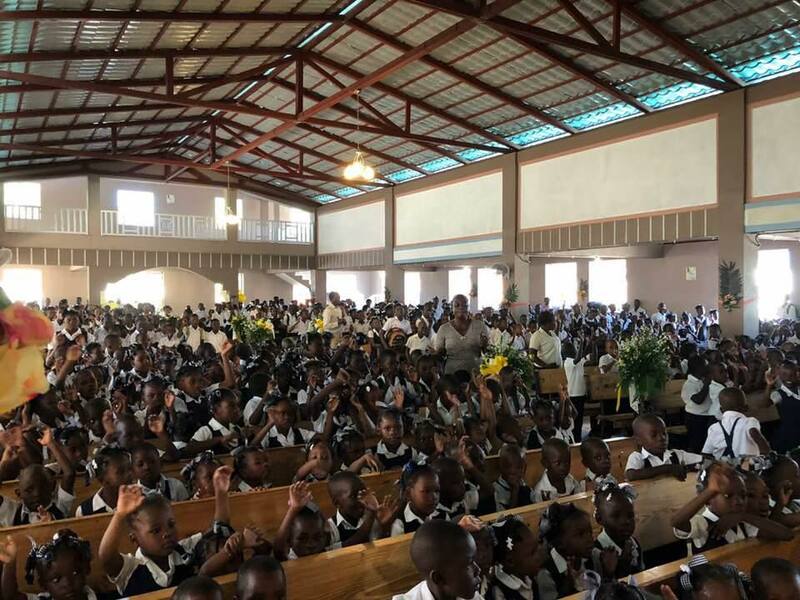 Fans are high on the priority list here in Haiti because the heat is like a smothering blanket in the middle of summer and on through September. Manno has been working for hours. First he had to buy a pipe downtown, get someone to drill holes in it, then spray paint it white. It took two days just to get this done and *voila* we had an extension for our fan. But, because the ceiling in our den is very high, Manno has been standing on a ladder with his head turned up for hours trying to install our fan. I’ve been thinking today about this and other things that give such joy — like Manno’s labor of love. It’s truly the little things like this that make one’s day. For months, we’ve been praying for rain. Finally, this week we had a few gentle showers which crept up like a stranger and blessed us at night. We didn’t even know it had come. By morning, we could only see the traces it had left behind. It’s the little things, like a refreshing rain, that nourish the soul. My friend, Kathy, came bearing gifts last week. While Steve ministered for hours to leave an impartation of rich spiritual food for our people, Kathy remembered the little things. Kathy brought dvd’s and said there are more on the way. I can’t tell you how many times we’ve watched the same movies over and over again. Kathy knew that and was thoughtful of ministering to us as well. Kathy has a friend I’ve never met. Yet, she sewed two beautiful lightweight house dresses for me after reading my post about the insufferable heat. How thoughtful! One was larger than the other, so I sent that one to Pastor Lefort’s wife who had just recently had a baby. It was both a joy to receive and a joy to give. We had received some food boxes from some dear friends just before Steve and Kathy had arrived. What fun it was unpacking them and even more fun eating the contents! How rich we are to have friends who remember the things we enjoy from the States. One of my friends sent a product of North Carolina in her box — sweet potatoes. She knows I love baked, sweet potatoes. It’s the little things. We have been blessed by some kind, thoughtful people who have remembered our Bible institute students. They send $20 a month — not really that much money, but a lot to a struggling student who doesn’t have a job. My list could continue, but I’ll draw the line here. I’m listening to the laughter and chatter of some of our church guys in the other room who were so happy to receive a sandwich, some popcorn, and some cookies tonight. Manno was rewarded for installing our fan and the others were rewarded — well, just for being there. It wasn’t a feast, but I didn’t want to send them away hungry. Listening to them laugh and talk Haitian politics was reward enough. It’s the little moments of the day that we remember and it’s the little things that add up to make life what it is. What are some of the little things that bring you joy and pleasure? Hey Beth, unfortunately your comment didn’t come through. Can you repost it? Thanks, Dana.